Today you will conduct a cold call campaign, in which you contact your target employers to discuss how you can add value to their companies. Many people do not enjoy cold calling – they worry about bothering the person on the other end of the line, or fear being rejected. 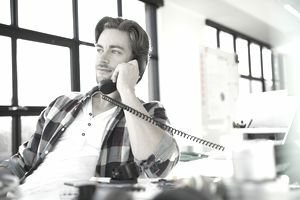 However, cold calling is a crucial job search technique. When done correctly, cold calling can greatly increase your chances of landing a dream job. Cold calling a company will not necessarily lead to an immediate job offer. However, there are a number of possible benefits of a cold call, all of which can enhance your chances of getting a job. Firstly, cold calling expands your professional network, putting you in immediate contact with an employer. Even if the company has no current job openings, you have a new professional contact, who may be able to point you towards a job opening in the future. Cold calling is also a great way to find out about unadvertised jobs. Companies often have job openings that they do not promote on job sites or even on their own websites. Speaking to an employer may give you inside tips about particular positions. Finally, cold calling can save you money. You do not need to hire a professional recruiter to contact employers for you – when done properly, cold calling can be extremely effective and much less expensive than using a recruiting service. Contact target companies only. Cold calling isn’t about contacting every company in your industry. Only call companies for which your experience and skills make you an ideal employee. This is the only way that a cold call can turn into a job offer. Contact the right company representative. Typically, you do not want to call the company executives. Try to contact someone in a functional role, such as a hiring manager, who will recognize your potential value. Do not call a human resources representative – the HR employee likely will not be able to give you the insider information that a hiring manager might. Figure out exactly who you will be calling, and research a bit about the person’s professional background online. Making the call more personal (and less like a cold call) will increase your chances of getting a positive response. Precede your call with an email. Consider sending a targeted cover letter and resume before calling the hiring manager. In your cover letter, explain how you can add value to or address a current problem or issue at the company. Mention that you will be calling within the week to follow up. This is especially a good idea if the idea of cold calling intimidates you – sending the cover letter and resume gives you a reason to call. If you do not want to send a long cover letter, consider sending a value proposition letter instead. Call at the right time. If the person you are calling seems annoyed or busy, offer to call back later. You can also call or email the person’s assistant to make an appointment for the phone call. Typically, calling early or late in the day is best. Explain how you can add value. Remember, you are the one initiating the conversation, so you need to explain why you are interested in the company, and how you think you could add value. Explain how you fit into the company’s mission, or how you can help address a problem or challenge the company is facing. Make the conversation about the company, not just about you. Don’t expect a job offer. Again, don’t expect to get an immediate interview. At the very least, you are expanding your network, which might help you find a new opportunity further down the road. Do not sound too disappointed or push too hard if the employer cannot offer you any information on job openings. Follow up. To maintain your new professional contact, follow up your cold call with a thank-you email. You can also connect with the employer on LinkedIn and/or Twitter.